Wine gifts are popular Business gift choices. 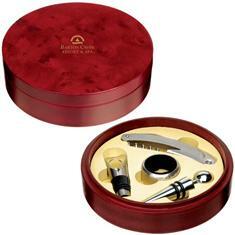 This stunning 4 piece Wine set comes in an elegant wood presentation case. Individually boxed for convenience. What a nice way to recognize your best Customers!